All Saints’ was originally observed in the West as All Martyrs’ in the spring. Since the number of those who have laid down their lives in the confession of Christ far outnumbers the days available in the Church’s yearly round, All Martyrs’ served as a sort of catchall. Pope Gregory III, bishop of Rome from AD 731 to 741, expanded the feast further to embrace all saints and ordered it observed on November 1. A similar Feast of All Saints’ is observed in the Eastern Church calendar on the Sunday following Pentecost. The joy of this particular feast is in its celebration of the unity of the Church Triumphant (the saints gathered already into rest) and the Church Militant (the present and future Church that struggles still under daily crosses). Together, both constitute but one communion, one fellowship. They are the crowd glimpsed in the reading from Revelation for this day, a vast multitude beyond human numbering and calculation. What makes them one is what they have received from the Lord: They have washed their robes and made them white in the blood of the Lamb. Their sins are forgiven and they hold the palm of victory He has placed in their hand. If you look at the crowd, you can readily discern that some were among earth’s famous and powerful. Most were quite unknown to history. There are some black, some white, and every color of the flesh of humanity. Some were very wealthy upon earth; most quite poor. Some spoke this language, others that. They come from every nation and tribe. What is most captivating about them, however, isn’t their diversity; it’s the unity of their attention. They aren’t paying the least bit of attention to themselves. They are united in their gaze upon the Lamb on His throne, the Lord Jesus Christ victorious in His sacrifice of love. And therein lies the secret to becoming part of that crowd. You do so not by squeezing in and trying to imitate the look of astonishment and awe upon their faces. Rather you share their blessedness by joining in what they are so fixated upon: Jesus Christ, who humbled Himself to become what they were (a child of man) in order to lift them up to become what He is (children of God). Almighty and everlasting God, You knit together Your faithful people of all times and places into one holy communion, the mystical Body of Your Son, Jesus Christ. Grant us so to follow Your blessed saints in all virtuous and godly living that, together with them, we may come to the unspeakable joys You have prepared for those who love You; through Jesus Christ, our Lord, who lives and reigns with You and the Holy Spirit, one God, now and forever. Amen. From Celebrating the Saints: The Feasts, Festivals, and Commemorations of Lutheran Service Book, pages 200–201 © 2016 by William C. Weedon. Published by Concordia Publishing House. All rights reserved. 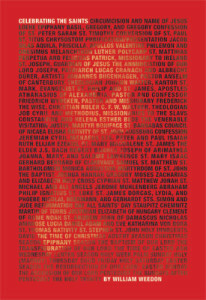 To order Celebrating the Saints, please contact CPH at 800-325-3040 or visit www.cph.org.